So, I've now covered all three of Sam Raimi's Evil Dead films, but I'd sort of feel like I was leaving things incomplete if I didn't follow those up with Drag Me To Hell (what'd you think I was gonna say Diablo Cody's Evil Dead remake?). Especially since there's a compelling reason to post about Drag here anyway. Besides it being almost, if not just, as good as the films in the Evil Dead trilogy but without the reverential status, so I feel like it's a bit neglected and deserving of another look... Did you know there's a UK import blu-ray with more, better extras? Update 6/2/18: Shout Factory's new Collector's Edition is out, but how much of an upgrade is it? And is there another replacement disc issue going on with it (spoilers: yes). Let's dig in and find out! Drag Me To Hell is Sam Raimi's return to horror, as well as a return to smaller films he has more creative control of, after having worked on a bunch of more traditional Hollywood films, particularly the Spider-Man trilogy. Fans had been calling for him to return to his roots for ages, and by all accounts Raimi was having the same feelings. And while he didn't quite come up with the Evil Dead 4 fans kept asking for, he gave us something very much in the same spirit. In fact, some will argue that it could be considered a direct sequel, operating in the same world and mythos (and one demonically possessed character, about midway through the film, is straight-up doing the entire Evil Dead schtick), just not in name and not focusing on Bruce Campbell's character this time around. There's something a little more traditional in Drag's concept though, centering things around a literal old gypsy's curse; but once it gets going it gets as crazy and enthusiastically insane as the ED films, and that's the heart of what we were all asking for anyway, isn't it? Now, Drag Me To Hell's another one that came out in that period when blu-rays were a thing, but I was still buying DVDs. So I've got the original, wide release Universal DVD, which came in a nice slipcover, and provided both the theatrical PG-13 cut of the film, and the unrated director's cut. Because it was such a major, broadly released title, and then perhaps undervalued by fans afterwards, it's one of those discs that can be picked up very cheap pretty much anyplace. So I figured it was a nice opportunity for an inexpensive upgrade to blu. And when I was looking into it, I discovered that the Lions Gate version released concurrently in the UK back in 2009 had more extras. And the US Drag was a good little release, but it had always been light on special features. And best of all, the UK discs had plummeted in price just like the US ones, so - score! But now in 2018, a new contender has entered the scene, looking to usurp both previous editions. Scream Factory has put out a 2-disc Collector's Edition, with new HD masters of the theatrical and unrated cuts taken from the 2k digital intermediates, plus all new extras. Unfortunately, when it first hit streets, there was a little problem with one of the discs. The "unrated" cut still had shots from the R-rated theatrical cut in them rather than the alternate unrated shots. Thankfully, though, Shout has implemented a replacement program. And copies available in stores like Best Buy already include the corrected disc. So just look for the little "V2" at the end of the code on disc 2, like in the shot above. If you have that, you're good to go. And yes, it's only disc 2 that ever had a problem and should have a "V2" on it. Universal's DVD theatrical cut third and their unrated DVD fourth. Universal's blu-ray theatrical cut fifth and their unrated blu-ray sixth. 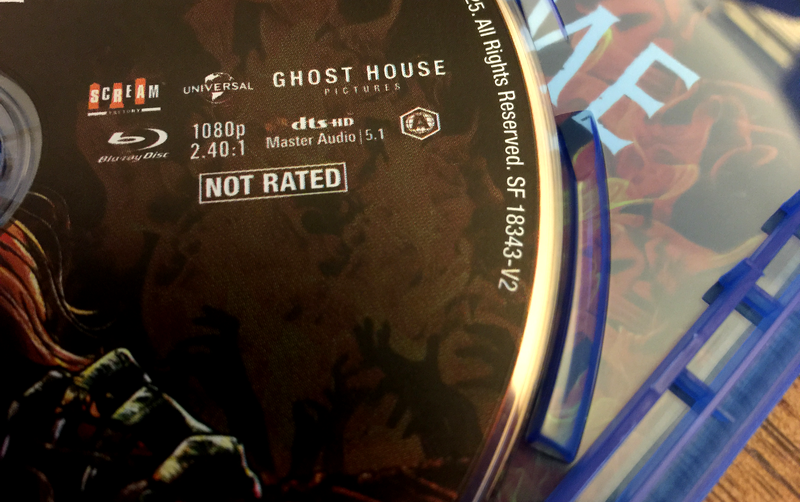 Scream Factory's blu-ray theatrical cut seventh and their unrated blu-ray eighth. Except for the Scream Factory release, each disc features both cuts (yes, they're all dual-layered). In fact, you'd have to search pretty hard to find a version with only one cut or the other. So in the interests of being complete, I've included comparison shots of both cuts, but they really look essentially identical every time. They are entirely different encodes (as opposed to using branching or something), but they're very close to the same size and practically speaking, there's no visible distinction. Of course, between the DVD and the blu is another matter. Sure, it's the same core transfer, framed at about 2.40:1, with the same color timing, etc. But standard def compression really didn't do this movie any favors, and the HD version is really beautiful. UK blu-ray left; US DVD right. Just look at it up close. What's in the shop window? A bunch of smeary, indiscernible objects? Everything is so much more clear and defined on the blu, you can tell what everything is, even items further in the background. And just looking at the flat side of the truck, grain is very evident, but on the DVD it's soft with smudged edges. It's an impressive difference. And speaking of impressive differences, how awesome are Scream Factory's new 2k scans? Actually, I think most viewers would be hard-pressed to spot the difference even in a direct comparison like this. They are technically different, of course. The 2018 versions seem to boast some slightly stronger colors and a slightly smoother image. But it's not a difference you'll ever notice just watching it on your television. They look the frikken' same. Yes, zooming in on close-ups, I can tell the new discs differ slightly from the old ones, but seriously, don't double-dip for PQ. All versions featured 5.1 audio, but you can hear the extra punch in the blu-rays DTS-HD track. All versions also have optional subtitles in English, but only the US Universal releases also feature Spanish and French dubs and subs, if those are a concern to you. Curiously, Scream Factory has also added a DTS-HD Stereo mix into the equation. Bonus? Now what's the deal with the two cuts, anyway? I mean, why would anyone care to watch the edited PG-13 version when they've got the uncensored director's cut on the same disc? Well, it is a little bit of overkill, but there's a reason they've bothered to preserve the theatrical cut as well. The cut version isn't just missing shots (although there are a few moments that really lose their impact precisely due to removed shots), it's also got some alternative bits that are unique to that version. Some of it's pretty inconsequential, like a demon's CGI blood being colored black instead of red, which I guess bothers the MPAA more. But one scene in particular, where our lead character decides to sacrifice her cat to appease the angry spirits haunting her, are 100% reshot, and not even in a similar way. Top: a shot only in the theatrical cut; bottom: a shot only in the uncut version. In the PG-13 cut, we see her looking around for her cat, finding it, and then cutting away to the exterior of the house as we hear sounds letting us know the gruesome deed was done. So, in the unrated version, it's the same but instead of cutting away, we see a shot of her killing it... right? No. Actually, it's totally different, and there is no bit of her looking around for and finding her cat in the laundry basket. Instead, it's a very dramatically shot moment where she comes towards the camera from shadowed silhouette to scream and repeatedly stab it. Two totally different scenes conveying the same plot point. Still, like I said, it's pretty much overkill. It's definitely better that they include both cuts rather than letting those alternate moments fade away into anecdotal film history. But the cat scene is the only hugely different scene. The rest is all short insert shots or slightly altered CGI. I think fans would have gotten a lot more out of just including the alternate cat scene in a little 5-minute featurette that also went over and showed the extra changes. Because it's really not worth sitting through the entire film a second time just to go, "oh, I see, that close up where the staple actually goes into her forehead has been removed, but everything else is exactly the same." But if it was a quick deleted scene, we could just quickly watch it and have the same take-away. Plus, a little deleted scenes feature would make the special features less barren and make this feel a little more like the special edition we all want. The Universal DVD only had one extra, but at least it was a good one. It was a roughly 30-minute featurette called Production Diaries, which is a series of short segments looking at different behind-the-scenes moments during the filmmaking. It's all hosted by Justin Long (who played the boyfriend in the film), and because it zeroes in on moments and details, it's a lot more interesting than your standard, promotional featurette where each actor describes their character and says how wonderful everybody else was to work with. It's fun and engaging. The only problem is how lonely it looks sitting all by itself on the special features page of the DVD menu. Great, but that's it? There's not even a trailer, although it autoplays a bunch of unrelated trailers at the start of the disc. Blah. Universal's blu-ray is a mirror of the DVD, except it has BD-Live... so it loads up "fresh" ads (when I tried it now in 2015, it brought up the Seth Rogen feature Neighbors and an ad for Universal's horror classics from the 40s). That's hardly an advantage. A genuine plus, I suppose, if you're one of the very select few people with a use for it, is that it's enhanced for D-Box. That's that thing where if you own a special chair wired to your entertainment system, it will vibrate at select times during the film. Not even the UK blu has that. Now, Lions Gate didn't exactly turn this into the fully loaded special edition we'd expect for a big Sam Raimi horror bonanza; but they at least managed to double what Universal had. The UK blu does also have the Production Diaries, so it's 100% profit, no trade-off. But it's also added another 30+ minutes worth of interviews. 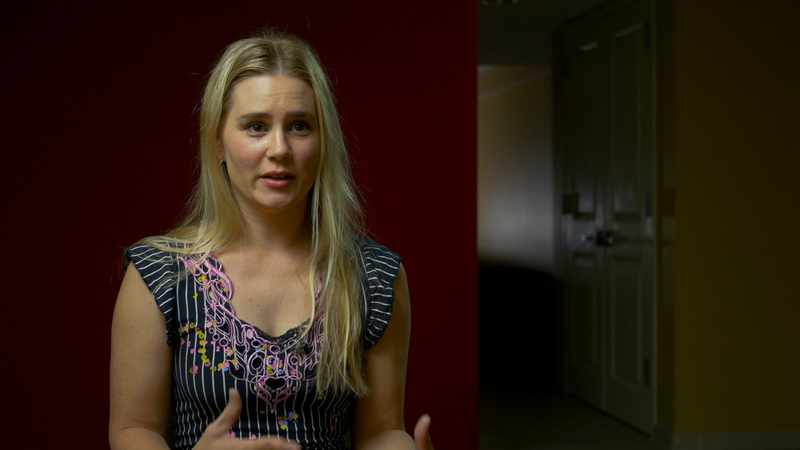 They talk to Raimi, Long and star Alison Lohman in three separate sit-downs. These are clearly promotional, but the woman doing the interviews is obviously a genuine fan, so she asks questions we really want to hear the answers to, like "where's our Bruce Campbell cameo?" (which gets an honest answer) rather than just prompting them to fawn all over each other. They're also delightfully uncut, showing us moments like when they take a break and Sam Raimi steps out of frame so a crewman can walk by, leaving us with a steady shot of an empty chair. So again, it's still no great collection of feature length documentaries and audio commentaries with the entire cast and crew; but they're good, fun pieces worth watching. Zavvi also reissued the UK blu as a steelbook, if you're a fan of those. And finally we come to the reason why anybody might really want to double-dip for the new Scream edition: brand new special features. Well, first of all, I'm happy to report, they've carried over everything from the previous editions, including those extra interviews from the UK disc. Sweet. But they've also added three new on-camera interviews, one with Alison Lohman, one with Lorna Raver (she played the gypsy and really enjoyed herself) and one with composer Christopher Young. Plus they added a new stills gallery. Honestly, that's a little underwhelming. Is it worth upgrading for just three 15 minute-ish interviews? Well, I will say that all three new interviews are really good and fun. And I'm glad they went back to get the second Lohman interview, because she doesn't just repeat the one we already have. And I should mention that the Scream edition features reversible artwork and a slipcover. But at the end of the day, it's an expensive release for three little interviews. Well, hey. The first and easiest conclusion to draw is that, with the fullest collection of extras and all transfers being essentially equal, the Scream Factory set is the best release on the market. So don't let me come off as to critical; I wouldn't recommend any other version above it. But if you already own the film on blu, I'd say it's a very low priority upgrade. It's a little more worth it if you have the US than the UK disc, because you'll be gaining more stuff; but it still feels a little short of "fully loaded." And even if this is your first time buying the movie, getting the UK disc with just a few less interviews for only a couple of bucks, compared to the full-price Scream set, is probably pretty tempting. I wish they'd had put their budget towards acquiring a few more new extras rather than new scans with no appreciable improvement. I know a Sam Raimi commentary probably wasn't an option, but more interviews with the likes of Dileep Rao, Reggie Lee, Bob Murowski and a segment with KNB would've made for a more exciting package. Still, the film's such a blast, every horror fan should own it in some fashion; and I can't be mad at us getting a slightly fancier option.